SUDS started 2018 on a high, supporting one of their biggest influences 'Future Of The Left' on their Australian Tour at Sydney's Oxford Art Factory and The Corner Hotel in Melbourne. At The Corner, the UK cult legends told the crowd that SUDS "will be playing with us again next time." Looking to bookend 2018 with another high, SUDS have announced a new single from their DIY recording sessions this year, self-produced by drummer Jesse Sewell. 'TRUMPauline' is the first blistering taste and shows a band bewildered by two certain politicians and the far-right supporter base that got them elected and re-elected. With four feet in Melbourne and two feet in Canberra, SUDS are a socially-aware political punk rock band to party to in the age of outrage. More songs & touring coming in 2019! 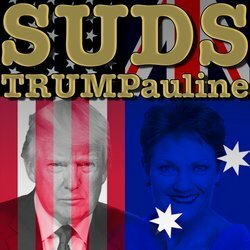 'TRUMPauline' is the first DIY single from Melbourne/Canberra three-piece SUDS' new self-produced recordings. It's a band bewildered by certain politicians and the far-right supporter base that voted them in. But it's also a punk rock banger to party to.